Volvo has released plans for a new self-driving vehicle that comes equipped with its own bedroom. 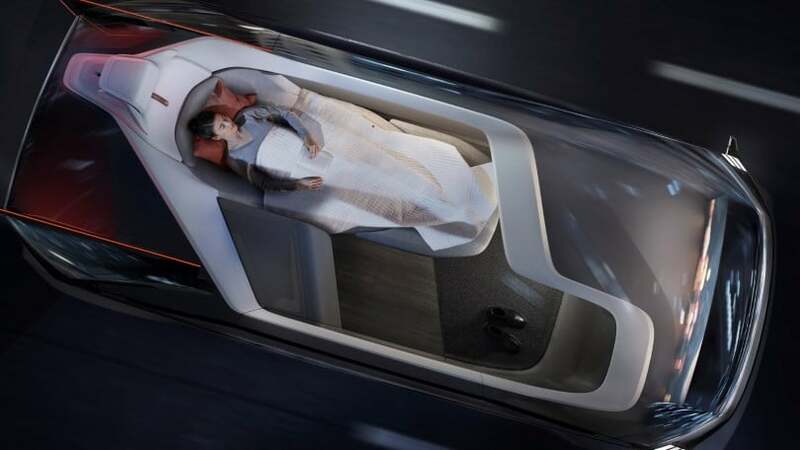 The company unveiled its 360c concept earlier this week, which detailed stratagem for a fully autonomous car that would allow passengers to catch some shut-eye while commuting from point A to point B. Though it appears the futuristic automobile would be just fine for everyday use, the 360c ad campaign sees Volvo positioning it as the next evolution in travel. The idea is that it could replace short-haul flights as a more practical (and comfortable) solution for getting between destinations such as Los Angeles and San Francisco or New York City and Washington D.C. According to a press release, the interior of the 360c can be transformed into four unique spaces: a sleeping environment (complete with pull-out bed), living room (featuring two chairs and a small table), mobile office (same set up as the living room), and entertainment space (with four chairs surrounding a large table for drinks and food). Since the car doesn’t require a driver, the vehicle can technically seat up to three rows of passengers. The business will change in the coming years and Volvo should lead that change of our industry. Autonomous drive will allow us to take the big next step in safety but also open up exciting new business models and allow consumers to spend time in the car doing what they want to do. Samuelsson added that he and the rest of his team expect autonomous cars to make up nearly one third of all vehicle sales by 2025, at which point they suspect 50% of cars will already be electric. While it’s uncertain when the 360c will officially hit the market, it’s clear that Volvo plans to stake its claim in the self-driving space early. Feature image provided courtesy of Volvo Cars.